One of the toughest things about riding in the upper midwest is the short to non-existent transition from cold to hot. Our last outing featured temperatures in the low 40’s with 25+ MPH winds and non-stop rain. Todays edition was about as far removed from that as you could get with forecast temperatures in the lower 90’s with the same 25+ MPH winds. The hourly forecast showed the winds building through the day and it was my hope that we’d get a lot of the southbound route done before it started blowing in earnest – no such luck! And continuing the “no such luck” theme – your faithful scribe got sick overnight before the ride and was up all night. I tried hard to go anyway but couldn’t eat anything and knew that a tough 400K on no sleep and no food wasn’t going to happen so I called it. Ended up not being able to eat all day so it was a good decision though I’m disappointed I didn’t get to do the ride. At the start. Already warm! 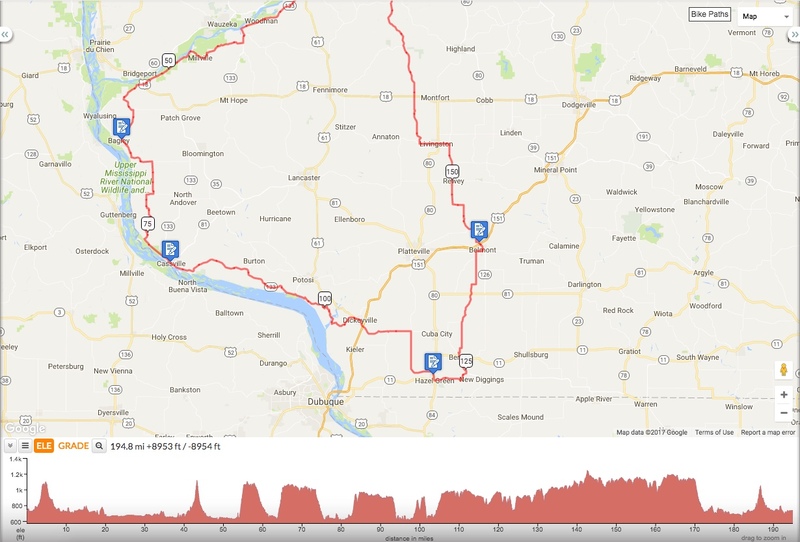 As was the case on our last ride, the 300K and 400K routes were identical for the first part of the ride, in this case all the way to the control at Hazel Green at 120 miles. This would once again prove to be a good thing. After getting the riders underway, I did various things through the day until mid-afternoon. Because it was so hot and the winds had started blowing hard early I knew it was going to be a tough day and although there were stops along the way to pick up water and take a break I also knew there were stretches that although short were up on the exposed ridge tops with no shade. Because of that I decided to drive the route in reverse with a cooler of water so I could top up any water bottles. Just before I left I got a text from Bob Booth from Hazel Green that Sven Peterson was having a tough time with the heat. 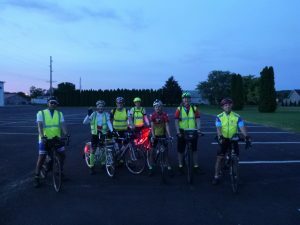 I called Bob and he said that the 3 400K riders had decided to sacrifice their ride so they could stay with Sven for the remainder of what was his first 300K – that’s true randonneuring spirit! Driving the route, I first encountered Rob Welsh at a non-control store at Livingston (155 miles done). He said he’d suffered with the heat/hills a bit but made a long refreshing stop at the control at Belmont and was feeling pretty good. He’d go on to finish the 300K in fine form. I then met the group of ex-400K riders and Sven at the Subway at Belmont with about 140 miles done. All were looking good including Sven who said he was feeling “OK”. I didn’t offer a ride but thought he might ask but he didn’t and soldiered on with the rest of the group. 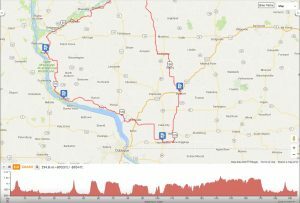 I continued on all the way to the control at Hazel Green at the 120 mile point for the ride without seeing the other two 300K riders. I thought they might have turned the horses for home so my wife and I started driving back toward Richland Center. We decided to stop and see if I could eat something in Platteville. This proved to be a bit of a stroke of luck for Peter and George. While we were eating Peter called and said they’d been unable to get George’s wife on the phone and wanted suggestions for how to get back to Richland Center. I told him I was close by and would come and pick them up. They’d made it as far as Dickeyville (105 miles) and had been struggling against the wind all day and decided to call it there. 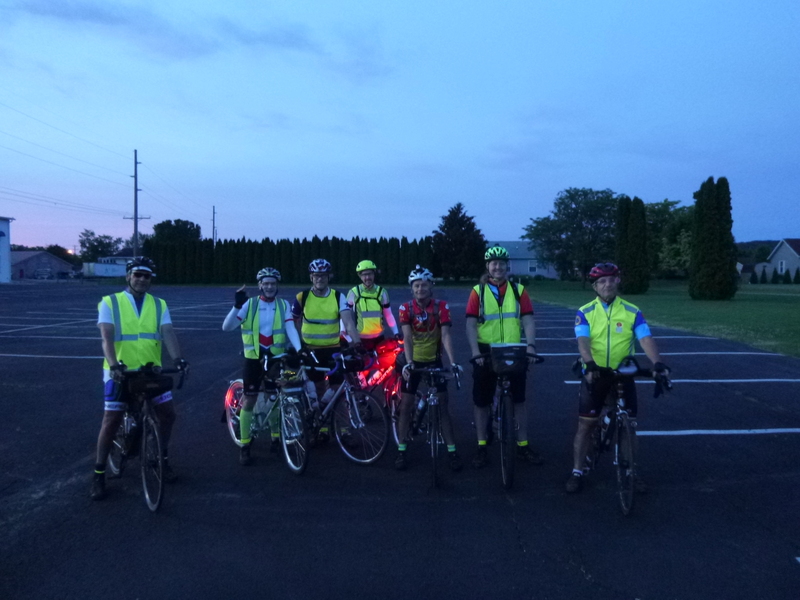 After picking them up, we drove back to Richland Center and saw the “gang of four” at the control in Muscoda with about 14 miles left to go. Sven was looking good at that point as they’d been riding with a tail wind for quite a ways and it was finally starting to cool off. They ended up finishing in fine form. Congratulations to Sven for finishing his first 300K! This is a tough route in good conditions and a real bear in the heat/wind. Props to the erstwhile 400K riders for sacrificing their finish to help him get his first ride done!